Aquaseal™, Hydratite™, and other HarperLove branded wet-strength resin products are used to improve the moisture-resistance of boxes in moist environments, such as high-humidity or tropical climates or refrigerated trucks. Most are available in varying concentration levels for differing needs. Performance boosters or enhancers such as LSP™, WRM II, and LiquiBond® Blue are used primarily to enhance the bond, allowing corrugators to run at higher speeds while reducing waste. Two-in-one products such as Aquaseal™ Plus and Multibond™ improve corrugator performance and increase wet strength in a single additive. LiquiBor™ and HydroBor™ are borax replacement liquids, providing all the performance benefits of traditional borax while completely eliminating the health and safety risks of employee exposure to airborne borax dust. NoBor™ enables corrugated manufacturers to produce a traditional starch adhesive without the use of boron. Many of our customers require products to address specific situations. Safety Mix™ eliminates the need for caustic soda. Concentrate DB™ requires no heat to cook the starch adhesive and only requires the water to be heated to operating temperature. Our specialty carriers are often used in high-value packaging, such as electronics, cosmetics or pharmaceuticals. Our one-bag-mix products, including OBM-B™, are formulated to meet the needs of plants making their own adhesives without automated starch kitchens. HarperLove products give the assurance of a correct, consistent formulation every time and allow the convenience of small-batch production. 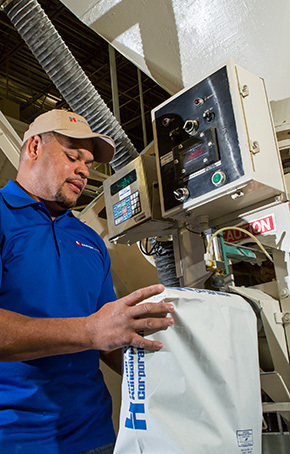 These specialty products help our customers address specific situations or challenges common in today’s production. Our custom products include defoamers to eliminate foaming and aeration; bacteria killers to lengthen the life of your adhesive (JT-1™ and JT-20™); products to sequester calcium to keep it from adhering to your rolls (Calciban™); penetrants to improve bonding of water-resistant papers (XM-5™); cleaners (Calci-Kleen™); and many more.